A version of our Young Chef's Kit that's perfect for kids ages 9 and up. 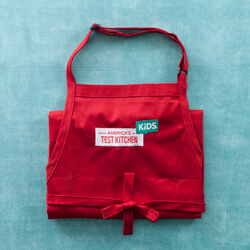 Our trademark TV show apron and The Complete Cookbook for Young Chefs provide foolproof recipes for their favorite foods, and a way to stay (relatively) clean while they cook. The Victorinox 6" Chef Knife and Kuhn Rikon Vegetable Peeler are proportioned well for kids 9 and older and will help them prep ingredients like a pro. 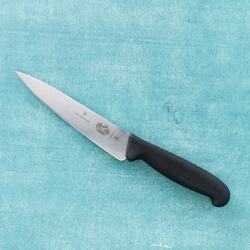 The smaller sibling of our favorite 8-inch chef's knife, this model was especially popular with our 12- and 13-year-old testers. It's an excellent knife that's sized just right for them. Its blade is sharp, so it never surprised our testers by bouncing off food. 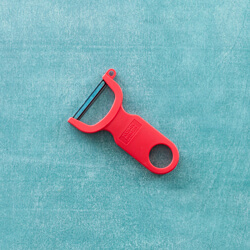 Kids reported that it made “good, clean cuts” through fibrous celery and that they “liked the blade a lot.” It had a comfortable, grippy handle that made the children feel safe and in control.